After the initial heart rendering iPhone 4 commercial few months ago, Apple has posted four new TV commercials to entice people to buy the new iPhone 4, heavily promoting FaceTime, a feature typical to the new smartphone which allows device owners to carry out video calls over a Wi-Fi network. The new ads are heavy on melodrama, bordering on cheesy. 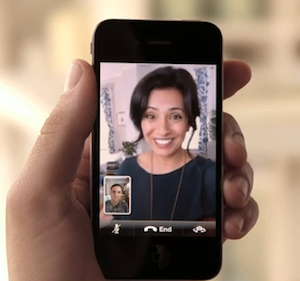 Apple’s sole intention with the new ads is to show just how many occasions call for video chatting – the birth of your grand-daughter, getting an unusual haircut, wearing braces, or giving your spouse the big news – “you’re gonna be a dad!” That, and selling a lot of iPhone 4 units. “iPhone 4 is the biggest leap since the original iPhone,” said Steve Jobs, Apple’s CEO, following the phone’s introduction at WWDC10. “FaceTime video calling sets a new standard for mobile communication, and our new Retina display is the highest resolution display ever in a phone, with text looking like it does on a fine printed page. We have been dreaming about both of these breakthroughs for decades,” Jobs added.